In recent years many nations have asked why not enough housing is being built or, when it is built, why it isn't of the highest quality or in the best, most sustainable, locations. 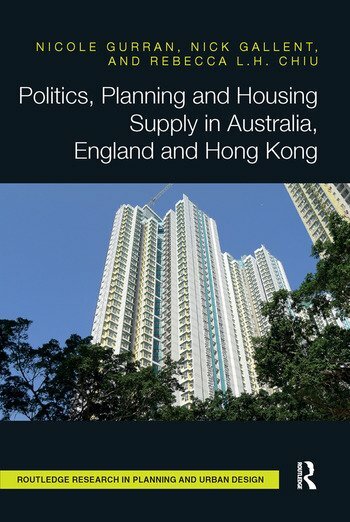 Politics, Planning and Housing Supply in Australia, England and Hong Kong examines the politics and planning of new homes in three very different settings, but with shared political traditions: in Australia, in England and in Hong Kong. It investigates the power-relationships and politics that underpin the allocation of land for large-scale residential schemes and the processes and politics that lead to particular development outcomes. what can be learned from these different systems for allocating land, building consensus between different stakeholders, and delivering a steady supply of high quality and well located homes accessible to, and appropriate for, diverse housing needs. This book frames each case study in a comprehensive examination of national and territorial frameworks before dissecting key local cases. These local cases – urban renewal and greenfield growth centres in Australia, new towns and strategic sites in England, and major development schemes in Hong Kong – explore how broader urban planning and housing policy goals play out at the local level. While the book highlights a number of potential strategies for improving planning and housing delivery processes, the real challenge is to give voice to a broader array of interests, reconstituting the political process surrounding planning and housing development to prioritise homes in well-planned places for the many, rather than simply facilitating investment opportunities for the few. Nicole Gurran is Professor of Urban and Regional Planning at the University of Sydney, Australia. Nick Gallent is Head of the Bartlett School of Planning and Professor of Housing and Planning at University College London, UK. Rebecca L.H. Chiu is Head and Professor at the Department of Urban Planning and Design, and the Director of the Centre of Urban Studies and Urban Planning of the University of Hong Kong, China.